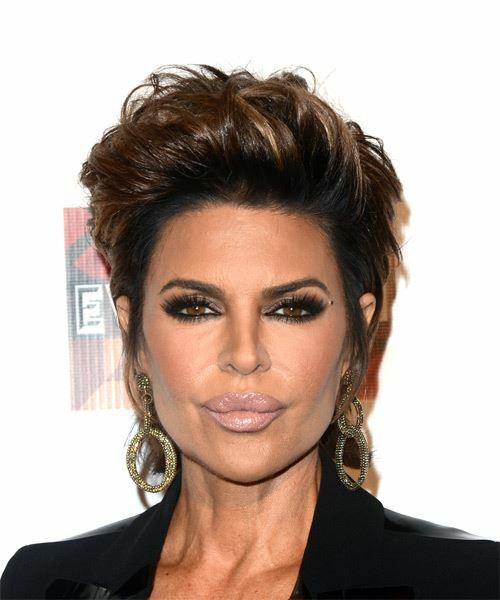 High volume is the main idea for Lisa Rinna's hairdo. The back is tapered into the nape of the neck while the sides and top are blow-waved back up and off the face for an ultra stylish look. This is a fantastic short hairstyle for a formal occasion where turning heads is a must! The rich chocolate brown color with caramel highlights finishes this 'do off nicely. Regular trims are needed to keep the shape of this 'do in tact. Apply mousse on towel dried hair and use a round brush to blow dry the hair up and off the face.